If you can’t find what you’re looking for, please contact us! Do you want to get rid of stubborn pockets of fat? Do you want to lose inches or tighten skin? If so, consider 3D Lipomed – a revolutionary NEW fat-reduction treatment available at the Chiltern Medical Clinic. Our 3D LipoMed treatment is a brand new three dimensional approach to body and face fat Removal, ensuring nothing else offers such a complete and effective solution, with dramatic results, without the need for surgery. How does 3D Lipomed Work? 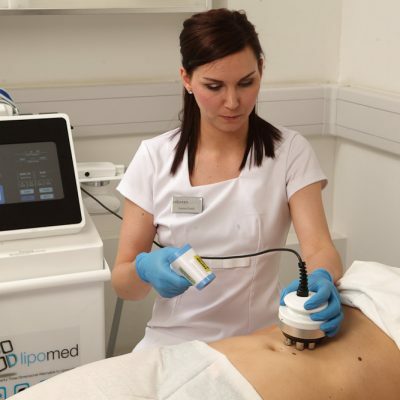 The 3D-lipo system gives clients several options and combinations to target and treat stubborn fat areas and cellulite. A full 3D liposuction treatment incorporates several individual procedures, including cavitation (which uses ultrasonic waves to break down fat cells), cryolipolysis (which freezes fat cells without affecting other body cells), radio frequency (which serves to tighten the skin) and dermology (rolling the skin to reduce cellulite). These treatments are available individually or as part of a larger fat-removal programme. What does ‘3D’ refer to? This procedure has three specific aims: fat removal, skin tightening, and cellulite reduction. The 3D liposuction device has several functions, all of which are geared towards achieving these goals. Which areas can you treat? Aside from the possibility of some mild discomfort directly after each treatment, this non-invasive approach to liposuction comes with very few risks or side effects, especially compared to traditional liposuction. Are there any cautions or contraindications? We cannot offer the 3D liposuction treatment to pregnant women or those who are currently breastfeeding. What is the aftercare for this treatment? Avoid consuming alcohol, caffeine, and large meals directly after 3D treatments. The cost of 3D Lipo will vary according to the size of the area to be treated and the number of sessions required. We will need to see you for an initial free consultation to assess your individual case and recommend a treatment plan. We will give you a breakdown of the treatment costs at the same time. Please call us on 01491 873 989 or 0118 958 2016. Alternatively, complete the form below and a member of our team will call you back shortly. If you are under the age of 18, you must be accompanied by a parent or guardian to an appointment. We would love to send you exclusive offers and more information about our services as well as a regular insightful newsletter. Please uncheck here if you would not like to receive this. We just wanted to thank you and let you know that we’ve received the message you sent via our website and it is currently being handled by a real-life human rather than floating around in the server. A member of our reception team will be in touch with you during business hours to answer your enquiry and any other questions you wish to ask. Although we always endeavour to contact you on the same day, occasionally we have to wait until the following morning if you messaged us late in the day or if the clinics are especially busy. We haven’t forgotten you though and promise to be in touch. If you need to speak to us urgently, you can call 01491 873 989 or 0118 958 2016. Please call us on 01491 873 989 or 0118 958 2016. Alternatively, complete the form below and a member of our team will call you back shortly. Please use the Finance Calculator below, to get an idea of how much a loan is from Omni Capital for a particular treatment. In order to get a quote that is specific to you, please book in for your consultation where you can discuss your requirements in complete confidence. * This is a guide only and not confirmation or guarantee of a loan from Omni Captial. Minimum spend: £280. All loans are subject to terms and conditions. In order to get a quote that is specific to you, please book in for your consultation where you can discuss your requirements in complete confidence. Finance available to persons aged 18 and over, subject to status. © 2019 Medical Skin Clinics Ltd Registered in England and Wales, Company No. 09696225. Registered Office: 1 Thames Court, High Street, Goring on Thames, RG8 9AQ, United Kingdom.